Asukayama Mountain was one of the popular places of the townspeople, where they were sent in the early spring for the khans – admiring the blooming cherry blossom. The mountain received its name from a small Shinto temple Asuka-medzi. In 1737 the eighth shogun Yesimune ordered to plant on Asukayama about a thousand sakura trees, declaring the entrance to the park territory of the monastery free. It was one of the first public parks of Edo and, despite the fact that it was up to eight kilometers from the center of the capital, it was always crowded here. In addition, Sabura bloomed here later than in other Edo parks and the pleasure could be extended. Groups of townspeople settled on mats on the edge of a low cliff. They drink sake, two men on the left perform a dance with fans, and on the very edge of the cliff the woman and child play in the dokinage, this is one of the favorite pastimes of the townspeople of the Edo period. From the cliff there is a view of the vast rice fields and the two-headed Uukubayama mountain rising in the distance. To her left are the Nikko mountains. In the foreground in the later version appears a dark strip, as well as a dark spot on the shore on the left. More clearly indicated is a distant plan, on which the mountain Tsukuba rises from the fog. The color of the sky becomes pinkish. The color of the square cartouche is changed. 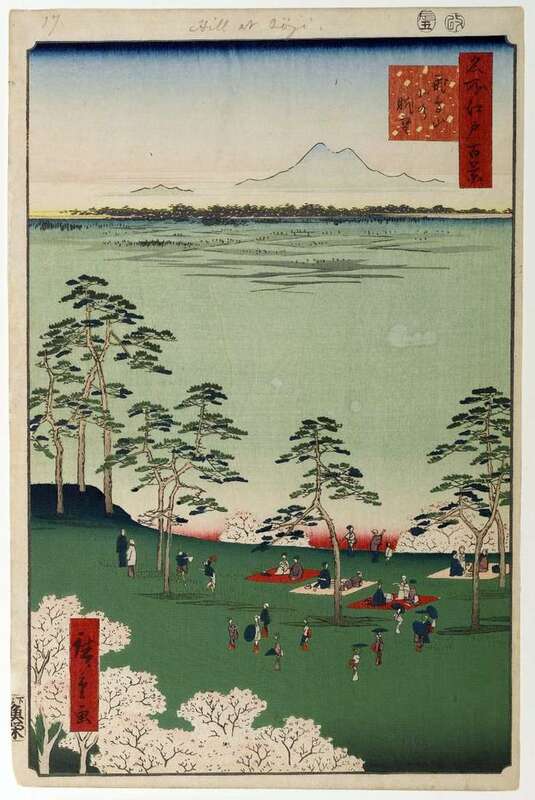 Description and meaning of the painting View to the north from Asukayama Mountain by Utagawa Hiroshige.